Home > Come see the new Far From Equilibrium! What drives research in science and in art? Is it curiosity? Uncertainty? Creativity? Perseverance? How are making art and doing science similar? In “Far From Equilibrium,” a choreographer, a composer, and a physicist work with artists and engineers to explore these questions. We start by exploring the concept of turbulence — a chaotic and mysterious twisting and stretching of fluid — with a thrilling modern dance accompanied by a live clarinet quartet. Then we immerse you, our audience, in an interactive research environment and invite you to carry out your own exploration. Ask your own questions about the double pendulum, generate your own turbulent flow, improvise your own turbulence dance, or write your own musical composition! 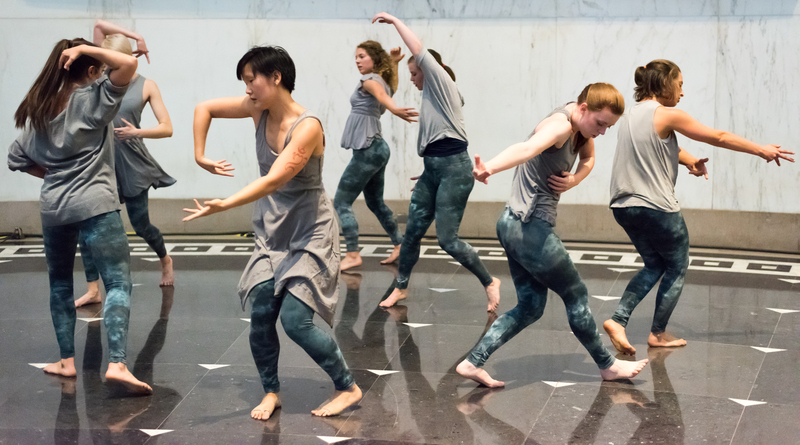 Two members of our group, physicist Elizabeth Hicks and choreographer Megan Rhyme, began working together last year to explore scientific thought through the language of dance. This year, the team has expanded from a duo to a group of nine who are all passionate about combining art and science. Award-winning composer Roger Zare is composing a brand new clarinet quartet which will accompany the dance. Dancer and engineer Mary Wu, software engineer and journalist Steve Tarzia, visual artist Brandon Waybright, engineer Nick Marchuk, math geek and part-time woodworker David Sopchik, and clarinetist Andy Hudson round out the team. We’ve been working as a group since March to discuss research and to design an interactive experience for the audience that highlights the wonder and excitement of the research process. Come see our show this weekend at Links Hall or at 12th Street Beach in July! Next Post: Visit Epsilon Delta Labs at the March for Science Chicago Expo on March 22!